Istanbul Aquarium, opened its doors in April 2011, is an official member of World Association of Zoos and Aquariums (WAZA). The site is 5 km from Atatürk International Airport, near the motorway and railway transportation systems in Florya, which is at the southwest coast of Istanbul. Istanbul Aquarium is the biggest aquariums in the world and biggest thematic aquarium in Europe. Aquarium hosts 16 themes and 1 rainforest going from the Black Sea towards the Pacific. Enjoj flyride 5D Helicopter Tour. FLYRIDE will get your feet off the ground! Ephesus, Aspendos, Nemrut, Cappadocia, Sumela Monastery and the other historical places…FLYRIDE, the helicopter tour in which you see the marvels of Turkey is the wonderful idea. FLYRIDE is not just a simulation tour, it will give you a unique experience! What is NOT included ? You can make your Tour Payment Cash or with Credit Card to our Guide during the tour. 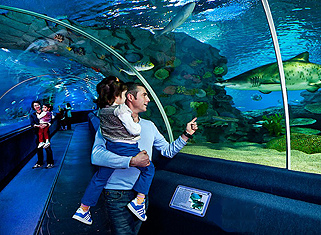 Istanbul Aquarium (Istanbul Akvaryum), opened its doors in April 2011, is an official member of World Association of Zoos and Aquariums (WAZA). The site is 5 km from Atatürk International Airport, near the motorway and railway transportation systems in Florya, which is at the southwest coast of Istanbul. Istanbul Aquarium is the biggest aquariums in the world and biggest thematic aquarium in Europe. Aquarium hosts 16 themes and 1 rainforest going from the Black Sea towards the Pacific. We start our Istanbul Aquarium Tour from Old city hotels and Ataturk airport with your pick up and transfer. We have an amazing tour in aquarium between hundreds of different fish and animal kinds. At the end of the tour, you will be transferred to your hotels. 2, 15-person, 6-axle 5D movie houses, providing the option to watch 7 separate films, an extraordinary system that makes live some effects such as wind, fog and water.